RUSH: Yesterday on this program, ladies and gentlemen… And I have to tell you, I want to thank everybody who sent me notes. I had more favorable response to the segments yesterday on insurance — what it is, how it is related to health insurance and preexisting conditions. I seriously had more email thanking me for doing that than I’ve had on anything in a long time. I’ve even had a couple of people say it was brilliant, and it was so good that I should repeat it, because more and more people need to hear it. Now, it took about three segments to go through, so I’m not going to repeat it verbatim here. But one of the points I made explaining how insurance actually works in terms of its business model, and how when you insure something after it’s happened, we’re not talking insurance here. Your house catches fire; you don’t have insurance. You can’t get homeowners insurance at that point. You have a yacht. You have a boat. Whatever. You don’t have insurance on it. It sinks. You can’t call an insurance company and have them insure it. It won’t happen. By the same token, insurance companies — if left to their own devices — would never insure people who already have a disease, particularly that’s terminal. They just won’t do it. It’s not insurance. Insurance — you know what it is. You pay a premium, hoping something never happens to you. The people you’re paying a premium to hope it never happens. You don’t want to be paid off because you don’t want the calamity to happen. The insurance company doesn’t want to pay off. They don’t want the calamity. You’re buying a policy. You’re buying insurance against something very devastating, catastrophic happening to you, hoping it never happens. And you’re willing to pay the price for the insurance companies to take the risk. You’re paying somebody else to take the risk, and make calculations on how much it’s going to cost them to insure you and other like-minded or like-circumstanced people, and these are called the actuarial tables. Words mean things. I’m the Mayor of Realville. I said, “We need to create a pool of money here that’s funded somehow, premiums from other people — government, additional people, whatever it is — and those people’s health care needs are taken care of out of that pool.” It’s about 4% of the American population that has preexisting conditions. And you can’t devise a national health care system or a national insurance policy for 4% of the population. You do it for the 96%. You handle the 4% in a different way. Well, in going through this — which I made crystal clear — I didn’t insult anybody. I didn’t do anything, but give everybody the lay of the land. The left is now trying to take what I said and, in doing so, they’re admitting they haven’t the slightest understanding of insurance. Therefore, they haven’t the slightest idea of what I said. They’re trying to take my comments yesterday — some of them are — and to drive a wedge. I don’t actually know between who. But their ultimate desire is to sabotage the Republican effort to repeal and replace Obamacare. SESAY: In terms of the crux of the matter, obviously preexisting conditions. That was the big issue. We know that they found some workaround for the House. But, you know, the likes of Rush Limbaugh are already coming out and saying, trying to provide insurance to people with preexisting conditions, it’s like… It’s essentially welfare. There are others who are opposed, who are offended by this. And they will cause problems down the line. RUSH: See? Trying to drive a wedge. Offended by my claim that what we’re essentially doing is putting people with preexisting conditions on welfare. Well, I don’t know. Call it what you will. It isn’t insurance. And that matters! We have already seen the destruction of all… We’ve seen the destruction of “marriage” because people don’t know what the definition of it is. We have seen the destruction of a whole lot of things that the left has wanted to blow up because people don’t know what the definition is and, therefore, are susceptible to concrete terms being redefined here. I’m sorry if the term “welfare” bothers anybody, but it is… If you don’t want to call it that, call it something else. But it’s not… (sigh) It isn’t insurance. If it were insurance, they wouldn’t sell it to these people. That’s the whole point! So when you tell the insurance companies they have to sell it to people, well, then it becomes something entirely different. The point of this, the reason this is important is that they represent 4% of the population. There’s already a pool of $130 billion in the health care bill before the lightbulb guy got involved, Fred Upton. There was already a pool of $130 billion in the Republican bill to handle people with preexisting conditions. They were not being left out. They were going to be accommodated, cared for, taken care of, what have you. There’s $130 billion in a pool over here. They didn’t create it. They didn’t pay any premiums to get that money there. Where did it come from? Now, Fred Upton, for whatever reason, the lightbulb guy… He’s the guy that led the ban on the incandescent lightbulb. He’s in Michigan. He’s in favor of those curlicue, whatever they are. The things… A disaster. The incandescent bulb was bad. Now they’re back. You can buy them again. But he demanded an $8 billion infusion into that pool. Making it $138 billion. And once that was promised to him, he became a “yes” vote from a “no” vote. Here is how the Republican consultant, John Thomas, reacted to the question you just heard from Isha Sesay. THOMAS: President Trump is not a principled conservative, and I think conservative leaders know that. So they’re speaking out more than ever against the president to hold him accountable because they’re worried that he’ll just go where the winds are blowing because he wants to make a deal. 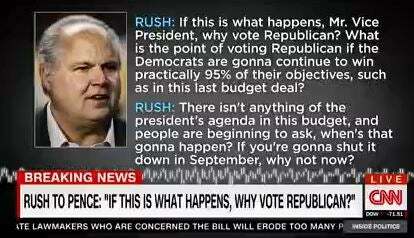 RUSH: I mean, that answer is what it is. I don’t get how it reacts to her question. But, anyway, that’s where we are with this. RUSH: I want to give you an example of how the Drive-By Media is attempting to sabotage the whole Republican effort here. Now, what happened? I happened to see it. It was about a half-hour ago. CNN’s John King. They’re doing a copycat of the show Fox does at noon. It’s essentially a panel discussion show. What John King, the CNN host did, is he played audio of every question I asked Vice President Pence earlier this week when Pence was here. What day was Pence here? Was it Monday or Tuesday? (interruption) Tuesday. He replays just my question, and one answer of the vice president’s at the end of the bite. Now, you heard the interview, so I’m not going to replay that. But every question, you know, was: “Why vote Republican if this is what it’s going to mean? “We keep hearing this: We’re kicking the can down the road. We’ll get them next time.” Those questions that I asked. “What’s the point of even voting Republican if the Democrats are going to win? If the Democrats are going to get their agenda, why are we even voting Republican?” He plays all of that. He plays Pence’s answer. He said, “We didn’t kick it down the road. We won. We smoked them this time,” and it’s what King said after that, that’s important here. RUSH: So they’re trying… The key point is when he says, “Let me be clear: They blame the Republican Congress as much if not more than the president.” How can you say that when I’m talking to the vice president? I was not talking to Paul Ryan. I was not talking to anybody in the House about kicking it down the road. I was talking to the vice president. I have been — if not on a tear, I have been — pretty demonstrative here that what has been missing in this thing is energy and impetus from the White House to get this done. Their agenda, they ought to know that the establishment doesn’t want it from the Republican leadership to the Democrat leadership to the K Street leadership. Nobody wants Trump to succeed. He’s going to have to ram it down their throats. But what they’re trying to do here is say, “See, they’re really blaming the Republicans in Congress more than they’re blaming Trump,” and they’re trying imply there that Trump is protected and nobody will criticize him because Trump voters are robotic supporters, and they’ll find any way they can to defend him and have to attack the Republicans. Fine. You may be right if you say that about others. But how can you say that about me when I’m challenging the vice president on this and not the House leadership? At any rate.